The tomato plant (Solanum lycopersicum) is a herbaceous plant that is part of the nightshade family. The plant is commonly grown all over the world for its fruit, the tomato. Though botanically classified as fruits, many people think of them as being garden vegetables due to their savory taste. Tomato plants are relatively easy to cultivate. They are warm-climate perennials that, during the summer months, are cultivated as annuals. There are hundreds of different varieties of tomato plants developed for home gardens. There are varieties developed to mature early, late and in the middle of the tomato-growing season. Early tomatoes, such as 'Quick Pick,' 'Early Girl' and 'Early Cascade,' take no more than two months to harvest. Mid-season tomatoes take between 60 and 69 days to harvest, and include 'Mountain Spring' and 'Champion.' Main and late-season varieties take up to 80 days to mature and include 'Supersonic,' 'Celebrity' and 'Beefsteak.' Pink, yellow and orange tomato varieties are also common, and according to University of Illinois Extension, are not lower in acid than red varieties and are safe to can. In general, tomato plants grow to heights of between 3 and 10 feet. Their stems are woody and weak, and tend to vine over other types of plants. The leaves of the tomato plant are between 4 and 10 inches in length. Tomato plants have pinnate leaves, and each petiole has between five and nine leaflets. The plants produce flowers, which are yellow in color with five lobes. It is crucial to exercise caution when handling tomato plants. 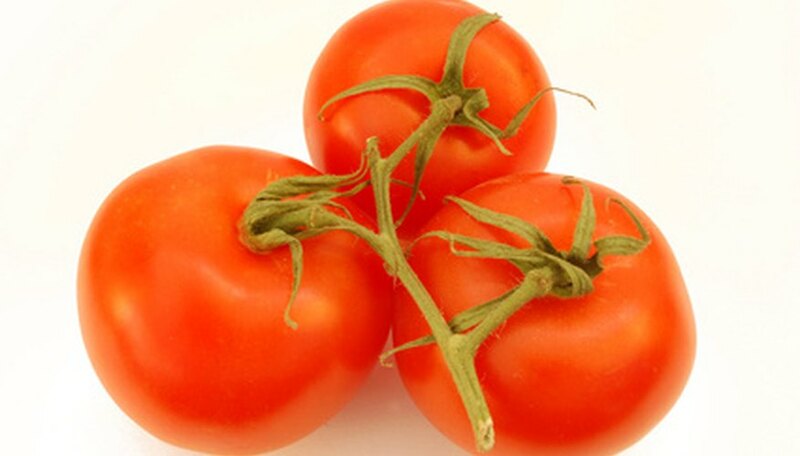 When the tomato fruit is unripe, the actual fruit, as well as its stems and leaves, consist of tomatine, which is a toxic glycoalkaloid with fungicidal properties. Tomato plants are toxic to animals such as dogs (both the plant and the unripe fruit itself), according to Cornell University's Department of Animal Science. Though Cornell notes a large quantity would have to be ingested to cause harm, it is a good idea to keep tomato plants away from small children and pets. Tomato plants are relatively easy to cultivate. The plants require regular watering, and thrive on full sun. Between 14 and 18 hours of direct sunlight daily is preferable. They are sensitive to frost. Tomato plants can be cultivated in all of the U.S. Department of Agriculture's (USDA) plant hardiness zones. Tomato plants grow well with soil that is well-drained and warm. The preferable pH range is between 6.0 and 7.0.